Awarded to a leader in college football who has realized his or her potential to make a positive and lasting impact on the Rare Disease Community. Click on a finalist to learn more and vote! Currently there are no finalists. Check back soon. An awareness campaign powered by Uplifting Athletes, the Rare Disease Champion is determined by college football fans and the Rare Disease Community through online voting. The award, part of the National College Football Awards Association (NCFAA), is presented to the winner at the Maxwell Football Club Awards Gala at the Tropicana Resort in Atlantic City, NJ, and celebrated at Uplifting Athletes’ Young Investigator Draft in Philadelphia. Sculpted by world renowned artist Brian Hanlon, the Rare Disease Champion trophy is in the likeness of Mark Herzlich, the former Boston College and current New York Giants linebacker who provided the inspiration for the award after overcoming a life-threatening battle with the rare disease Ewing’s sarcoma in 2009. Uplifting Athletes will publicly announce the winner of the next Rare Disease Champion Award from the Home Depot College Football Awards Show at the College Football Hall of Fame in Atlanta in December 2019. Online voting to help determine the next Uplifting Athletes Rare Disease Champion will be open this Fall. Joshua Eargle's daughter Landrey is the first known case in the United States to be diagnosed with the condition of a rare gene mutation of the CSNK2B gene. She battles myoclonic epilepsy, intellectual disability, a congenital heart defect, and immunodeficiency. She spent the first 73 days of her life critically ill on life support enduring a major open heart surgery, surviving four codes. Until the age of four, Landrey was critically or acutely ill 40 percent of her life. There is no cure for this condition. Coach Eargle is tenacious, but not because he would ever have wanted the battle it took to reveal the character developed. His calm under extreme pressure allows their family to have a laser focus on their family's mission: to impact people through faith, to demonstrate joy through adversity and to medically document the future of the rare gene mutation their daughter battles. A Florida native, Griffin was born with the rare disorder amniotic band syndrome. As a youngster, Griffin tried to “play through” the pain. But, the pain became unbearable and the decision was made to remove his left hand when he was 4 years old. In every phase of life the former UCF star and NFL draft pick refused to let his rare disease slow him down or hold him back. Read his Uplifting Story here! Meyers endured a long and difficult 18-month journey with the rare disease Hodgkin’s lymphoma after the Iowa State defensive end was diagnosed prior to his senior year. Following an up-and-down treatment protocol of more than a year, Meyers returned to school for his senior season in 2017. With an almost completely new coaching staff in place Meyers earned a starting spot at defensive end, played in every game and was chosen as a team captain. Born with retinoblastoma, a cancer of the eyes, the life-long Trojans fan watched as much USC football as possible before losing his sight in 2009. This never slowed Olson down, as he learned to be a long snapper in high school and in 2015 he earned a spot on the roster of his beloved USC Trojans. After establishing himself as one of the top deep threat receivers in the country, Coates won the 2015 Rare Disease Champion Award after forming a close friendship with Kenzie Ray, a young leukemia patient and Auburn fan, and giving her support and hope throughout her chemotherapy treatment. The 2014 champion played a pivotal role in the planning and execution of the 69-yard TD run by Jack Hoffman during the Huskers’ 2013 spring game. He was also President of the Nebraska Chapter and was selected as a member of the AFCA Allstate Good Works Team. 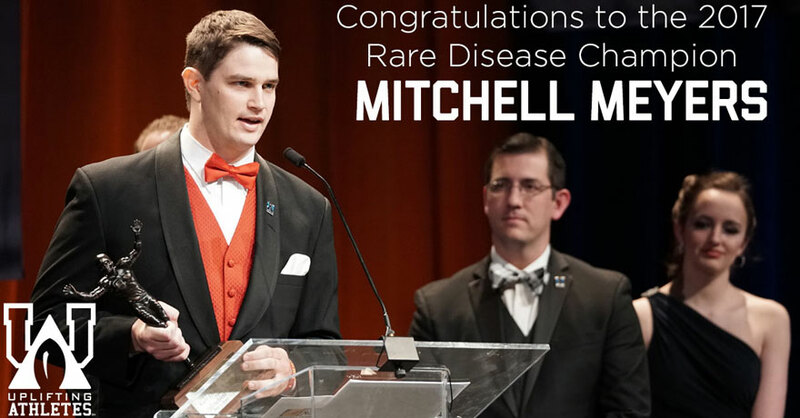 The 2013 Rare Disease Champion was an offensive lineman for the Nittany Lions. During Shrive's 5-year career at Penn State he was always involved with the Uplifting Athletes Chapter and raised more than $100,000 for kidney cancer research. A veteran for the Cincinnati Bengals and a strong supporter of the Team Jack Foundation, Burkhead’s relationship with a 6-year-old Jack Hoffman, who suffers from a pediatric brain tumor, inspired his Husker teammates to fight back by raising awareness and providing support for him and his family. Culbreath’s personal battle with aplastic anemia served as an inspiration for his teammates and an inspiration to the rare disease community. The running back lost missed his junior season when he was diagnosed, but battled back to play his final season for the Tigers. Dickinson College’s Ian Mitchell was named the 2010 Rare Disease Champion. Mitchell raised more than $95,000 in his collegiate career in honor of a childhood friend who passed away from a rare form of bone cancer. The 2009 recipient was Grant Teaff of the American Football Coaches Association (AFCA), selected for its nation-wide effort to raise awareness about Duchenne Muscular Distrophy through their one-day event “Coach to Cure MD”, which raised more than $230,000 in 2008. Uplifting Athletes is a national nonprofit organization that inspires the Rare Disease Community with hope through the power of sport and empowers medical researchers to find cures. A rare disease is one that affects fewer than 200,000 Americans and consequently lacks financial incentive to make and market new treatments. Founded in 2007, the Uplifting Athletes national network of college football FBS and FCS chapters are run by current college football student-athletes.